The black walnut tree is one of the most valuable of our native trees. It’s in such high demand for making veneers that there are walnut rustlers that will even steal the trees in the dark of night. The wood is prized for its beautiful color and strong durability. The tightly grained wood is easy to work with, and furniture and cabinetmakers love to use it. Early settlers found black walnut trees growing in forests from Canada all the way to Florida. 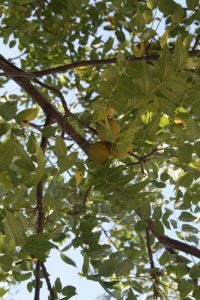 When it is surrounded by other trees the black walnut will grow straight and tall, and when planted in the open, it will branch out closer to the ground. This shape makes it easier to harvest the round 2- to 3-inch nuts. The settlers ate the nuts as snacks, or ground them into meal to use in baking, or cooked them in soups and stews, or stored them over the winter. The settlers discovered the dark brown walnut heart-wood to be especially resistant to decay. They enjoyed using it for fence posts, shingles, poles and sills. Black walnuts make nice shade trees, commonly growing to 50 feet or more, and about as wide. The fern-like foliage creates light and airy shade for plants and grasses growing underneath, as long as they’re not affected by juglone. Juglone is a natural herbicide produced by the roots of the black walnut. Some plants such as rhododendrons, azaleas, lilacs, tomatoes, and berries may be killed or stunted by juglone if they are growing close to a black walnut tree. At Hunski Hardwoods, we have a great variety of walnut slab, perfect for your next project.